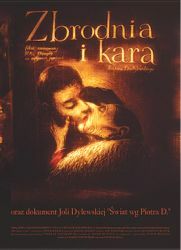 ZBRODNIA I KARA / CRIME AND PUNISHMENT is the story of crime and love, a story at the edge of dream and reality. As Dumala says, "It is the story of love and of how love can be destroyed by obsession. In our lives we are subject to two contradictory drives - the drive to be good and bad, the propensity to love and to hate". Screenplay based on the novel by Fyodor Dostoyevsky, direction, animation, scenery design, and visuals: Piotr Dumala; cinematography: Jan Ptasinski; produced by Bow&Axe Entertainment, TVP S.A.; distribution: SPInka. Cinema premiere: February 15, 2002; duration: 34 min. In cinemas CRIME AND PUNISHMENT by Piotr Dumala will be shown together with Jolanta Dylewska's film SWIAT WG PIOTRA D. / THE WORLD ACCORDING TO PIOTR D.
"Throughout our lives, any and all encounters with living beings, things or situations are replete with hidden meanings. By looking at Piotr - at his concentrated, focused gaze - and looking through his eyes at the world that surrounds us, listening to his thoughts, we can deepen and enrich our experience of his art". Direction, screenplay, cinematography: Jolanta Dylewska; produced by Marek Nowowiejski; distributed by SPInka. Cinema premiere: February 15, 2002; duration: 27 min.